A series of recent market reports highlight that the demand for digital English language learning products is booming in global education markets. The research firm Ambient Insight reports that revenues from digital English language learning products reached US$863.1 million in Asia in 2013, and projects that category revenues will nearly double to US$1.6 billion by 2018. A special country report, also from Ambient, notes that China, with a growth rate of 23.6% over the past five years, is now the top buying country of digital English language products worldwide. Category revenues in China are expected to triple from US$323 million in 2013 to US$932 million by 2018. 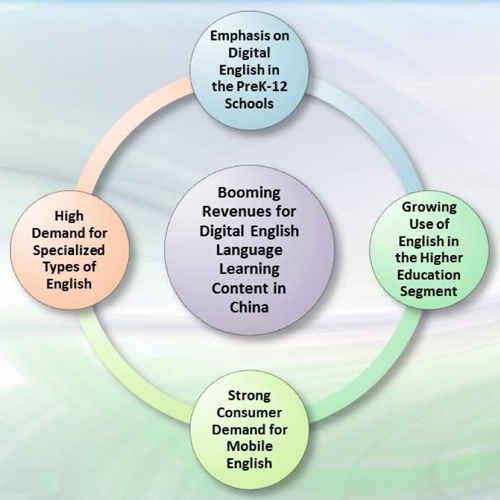 As the following figure reflects, growth in China is being driven chiefly by emphasis on digital English learning in schools, use of English in Chinese higher education, strong consumer demand for mobile language learning apps, and high demand for English in the corporate and government sectors. Mobile services (VAS: Value-added services). Mobile products generated the highest revenues for suppliers in 2013. 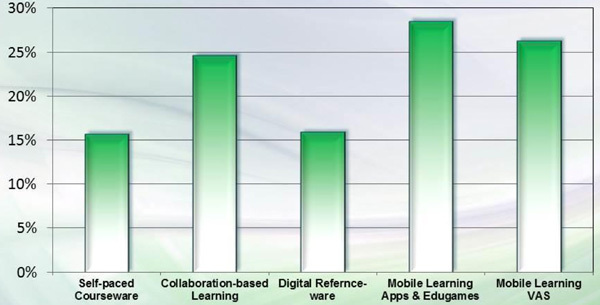 Mobile educational apps, edugames, and VAS subscriptions are now the top-selling types of digital English language learning products in China, followed by live online tutoring and self-paced courseware. The report also suggests there is a lucrative market for online English test preparation that targets China’s national higher education entrance exams, the gaokao. Driven by the emphasis on preparation for the gaokao, K-12 revenues for digital language learning products are concentrated in the higher grades and heavily clustered in grades 10-12. 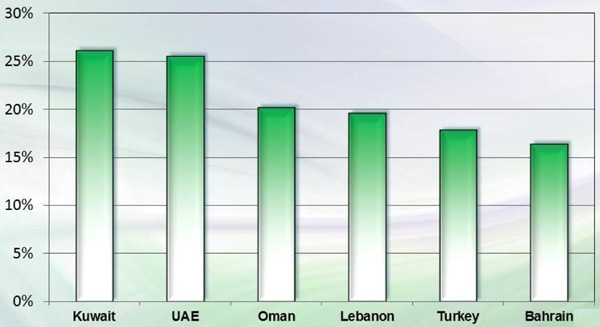 Looking outside Asia, a further Ambient report predicts the digital language learning market in the Middle East will nearly double to reach US$215.7 million by 2018. In total, these latest projections are even higher than those we reported on less than two years ago in our article, “Opportunities abound in digital English language learning market,” which contains forecasts till 2016 as well as a round-up of government mandates to promote English and digital trends in classrooms around the world. While many debate the impact of technology on learning outcomes, Mark Warschauer, professor of education and informatics at the University of California, suggests that giving students extra chances to communicate in the target language can be highly motivating. “[The] use of Twitter, email, discussion forums, Skype, and other tools can provide authentic communication opportunities that are too often lacking in language class,” he says. While discussion around the efficacy of technology-based teaching and learning resources continues, there are many examples as to how digital learning tools are reshaping language instruction around the world. A recent article in The Chronicle of Higher Education outlines how telecollaboration (or “teletandem”) uses video-conferencing – such as Skype, Google Hangouts, or Adobe Connect – to complement both in-person and online language courses. Students in a Spanish class in the United Kingdom, for example, may be paired online with students in an English course abroad, with students matched up based on language ability. In one example of telecollaboration profiled recently in The Telegraph, Brazilian students looking to improve their English were paired with retired Americans for free video conversations. These partnerships were facilitated through a project called Speaking Exchange, developed by the Brazilian language company CAN. To access Speaking Exchange, a Brazilian student simply logs into the app, selects an elderly person who is online, and begins a conversation via webcam, guided by an initial suggestion of topics provided by the supplier. The final conversation is uploaded via private link to the company’s YouTube channel for teacher assessment. Technology also places additional opportunities for learning a new language directly in the hands of students, and in sometimes surprising ways. A recent piece in Forbes, for example, recommends switching your automobile’s GPS system to the target foreign language as one easy way of using technology to enhance language learning. Similarly, changing your language settings on any number of personal devices – a smartphone, for example, or tablet or computer – provides an opportunity to use a new language to complete routine daily tasks. While these self-directed options will not replace traditional classroom learning anytime soon, they do represent important new opportunities for practice and exposure to the target language. Particularly given the dramatic growth forecasts for the next several years, it will be interesting to see how the culture and practice of English language learning will change and evolve as both students and teachers continue to make greater use of technology in their English studies. This entry was posted in Africa, Asia, Australia/Oceania, Bahrain, Brazil, China, Europe, K-12, Language Learning, Lebanon, Middle East, North America, Oman, Online Learning, Regions, Research, South & Central America, Technology, Turkey, UAE and tagged boarding schools, language test, higher ed technology, online learning, language schools.